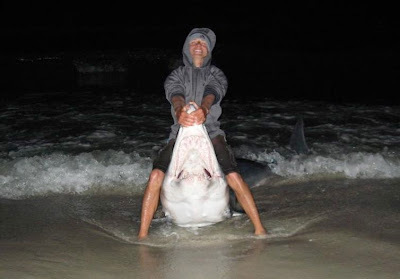 Will Smith—the fisherman, not the actor–was fishing for sharks past midnight on a Florida beach a couple weeks ago when his reel started singing, line racing out to indicate a huge fish. He strapped on a fishing harness and, with the help of Bill Dunlop, held on for a 45-minute battle that resulted in a prized catch. Smith beached a behemoth mako shark measuring 10 feet, 8 inches in length with a 60-inch girth. 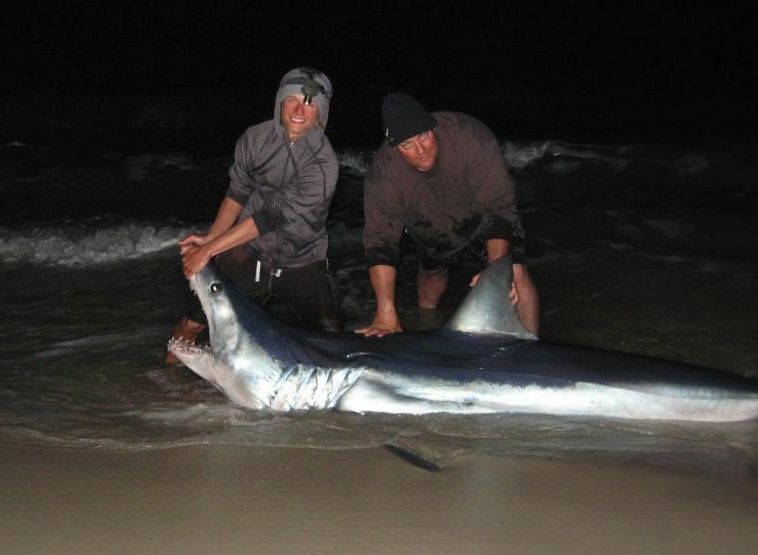 The expert shark anglers measured the massive mako and took the incredible photos you see here before reviving and releasing the shark, so there isn’t an accurate weight. But according to some weight-estimate formulas, a mako measuring 10 feet to the fork of the tail with a 60-inch girth would weigh 540 pounds. Smith and leaderman Bill Dunlop with the shark. William Fundora, president of the conservation-minded South Florida Shark Club, which first broke the news of the catch, estimated the shark at 550 pounds. Catching sharks from the beach at night is a popular fishing activity in Florida, especially with the Internet making it easy to obtain how-to and where-to knowledge about the sport. 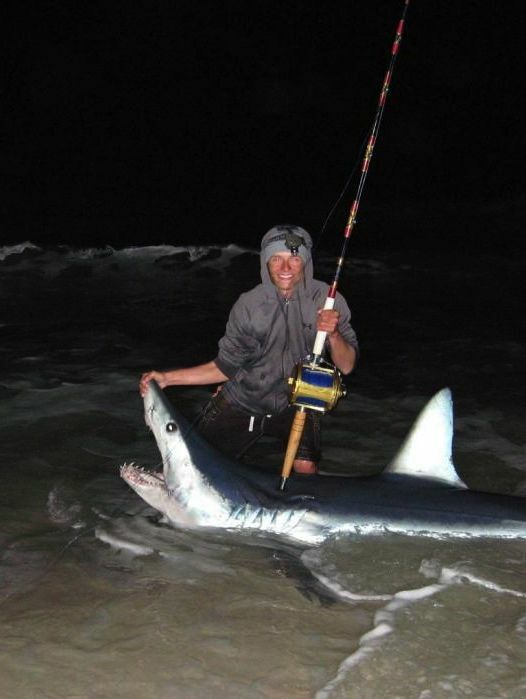 Anglers are using their ingenuity, too, utilizing kayaks to paddle out past the surfline to drop their baits, according to Sport Fishing Magazine. As for the exact location where Smith landed the huge mako, that will remain a secret, what with the month-long Big Hammer Shark Tournament starting Friday. 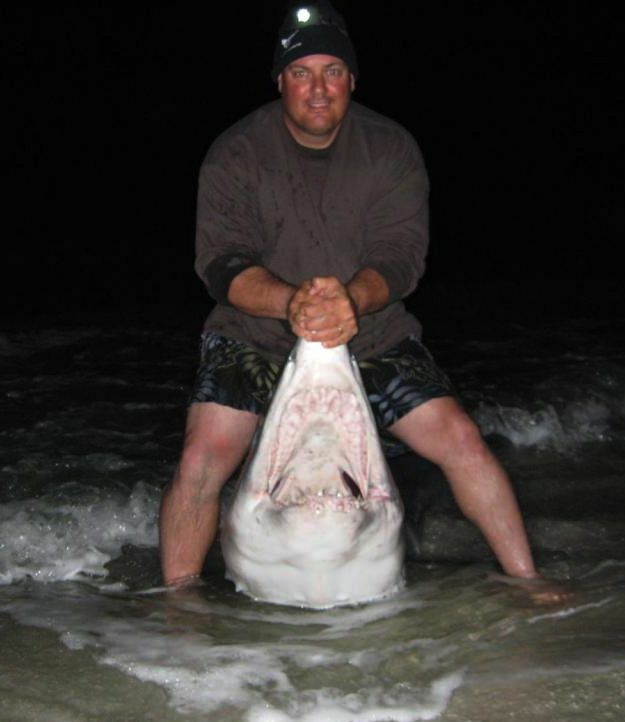 Not surprisingly, fellow anglers commenting on the catch on the South Florida Shark Club forum were amazed by the enormity of the shark. Dunlop, meanwhile, wasn’t just a bystander. He helped hold on to Smith so the shark wouldn’t drag him into the water. “During the fight, I had to sit on the ground behind Will and hold his harness because this shark was pulling 40 pounds of drag,” Dunlop wrote. The fish finally tired as it came close to shore. Upon grabbing the leader, Dunlop got tossed around a bit until Smith was able to tail rope the fish and ensure the catch.